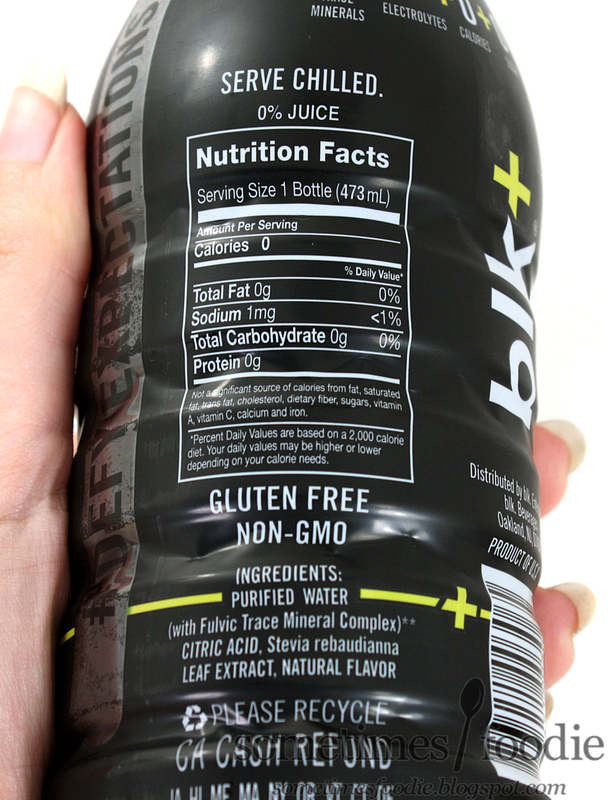 Two year ago, back when Sometimes Foodie was only on tumblr, I reviewed blk water. 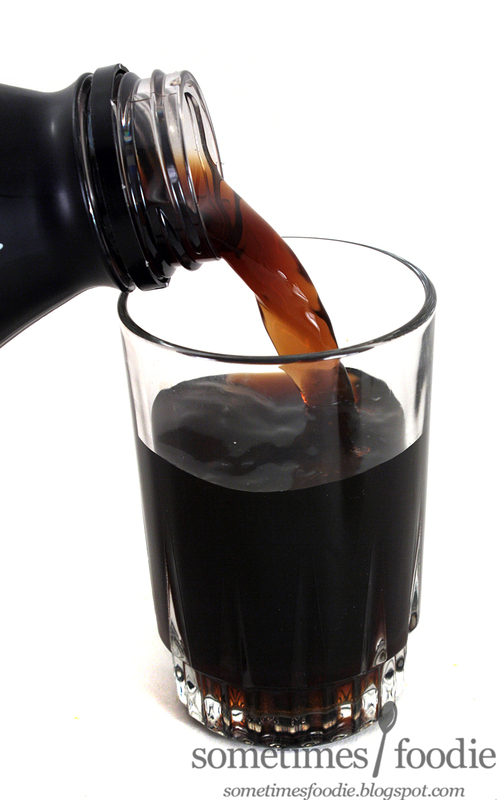 Visually, it's stunning, I mean...it's water, but it's black! How cool is that? (I was goth in high school, back then I would have bought this stuff by the case just for the goth-y street cred.) Other than being a dark color, it was just water. Sure, there was a slightly charcoal-like aftertaste, but there was nothing truly special about it, so I haven't repurchased it since. I was walking around the grocery store a little while ago and I saw that blk was expanding their product line with some new flavored waters. Even though I wasn't wowed by the normal blk, I do love the concept behind this product line, so I thought I'd pick one of the flavors out and give it a review. I twisted the cap off and poured it into a glass. Maybe it's just me, but this seems a bit lighter in color than the original blk. Lemon juice is a natural lightener, but this contains no real juice at all, just "natural flavoring." 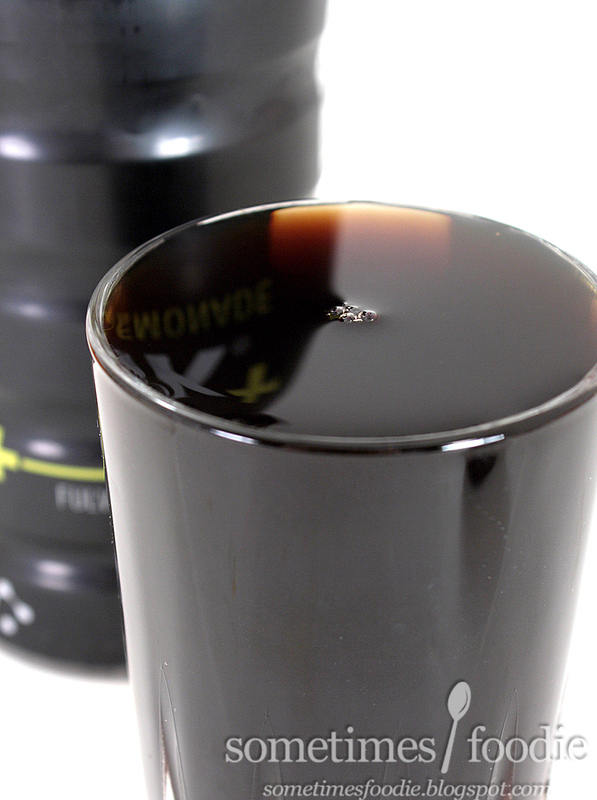 The liquid has a faint citrus aroma, but it doesn't smell all that authentic. This is more like the lemon juice you can buy in a squeezable plastic lemon than the real deal, but it's appealing in it's own way. it tastes like every other lemon flavored water on the market. There is absolutely nothing special about this flavoring, and it's very artificial. Urg, the photographer and artist in me is so disappointed. This doesn't taste even half as interesting as it looks. All of those flavored sugar free fruit-based waters you see on the grocery store shelves taste just like this, there's a slightly charcoal-like aftertaste, which I do enjoy, but not enough to rebuy this product. These blk waters are so beautiful, but they're a novelty item. Once you get over the fact that it's so pretty, and interesting to look at, the product itself doesn't have enough substance to make you come back. These drinks are perfect for themed parties, or high school goths (like myself), but the taste just isn't there. Come on blk! I want to love you! Please reformulate these flavored drinks and make them more worthwhile!